I am off to Milan! You can follow the discussion panel chaired by Michael Edwards, "Translating Perfume into Words: Writing about an unseen art form" on Friday March 30th at 14.00 (GST +1). 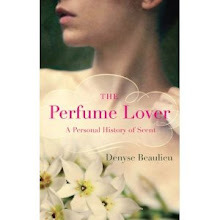 The aim of this workshop is to discuss the correlation between the publishing and the fragrance industries. What are the difficulties of writing about an invisible and incredibly subjective artform? What are the effects that the varied forms of perfume journalism might have on the market? 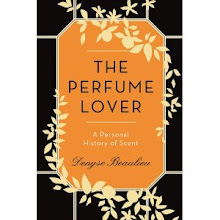 Right after that, on Friday 30th at 15.30 (GST+1), the Italian journalist and author of Proust's Overcoat, Lorenza Foschini, will interview me on The Perfume Lover. Pour mes lecteurs francophones: Mon interview par Lorenza Foschini, auteur du Pardessus de Proust, aura lieu le vendredi 30 mars à 15.30 en français. Will you be at the exhibition on Saturday? I would love to meet you and pf course also to try Séville à l'aube. Being a relative newcomer to Milan, it would also be great to meet fellow readers of the blog and make new perfume-friends. How about having a blog meet-up tomorrow? Of course, only if your schedule permits Denyse. Kata, I will be there on Saturday from 10.30 to 1 PM at the Aedes de Venustas counter. Hope to see you tomorrow! Thanks for the heads up! See you tomorrow. Bonsoir, je suis heureuse de vous avoir connue, vous savez combien j'apprécie votre blog. J'attends l'édition français de votre livre! Ana Maria, moi aussi je suis ravie de vous avoir (trop brièvement) rencontrée... La prochaine fois je planifierai mieux, pour avoir la chance de bavarder! Did you manage to find SixScents Series 4 displayed or did they pull a "nasomatto" (with the empty stall) in Esxence? I was in Milan <36 hours total, and missed you. I'll bet you rocked them all. Ida, pas possible! I did catch someone of the corner of my eye that made me think of you, and for all I know might have been you. What a pity... Next year perhaps?